The Nenets people (ненец ‘nenets’, ненцы ‘nentsy’ (pl.) in Russian) are a group who have inhabited the northwestern Russian tundra for approximately 2,000 years. Their traditional nomadic lifestyle is based on reindeer herding, and their shamanistic beliefs emphasize respect for the land and natural resources. Oppression has reduced their numbers and threatened the loss of their culture. Those who have been assimilated into urban life face complete loss of tradition and language. Those who continue their nomadic lifestyle are dependent on freedom to travel with their reindeer, but need support to preserve their language and traditions since recent generations have been educated within Russian-speaking environments. Nenets is the singular noun for the Nentsy people, (ненец ‘nenets’, ненцы ‘nentsy’ (pl.) 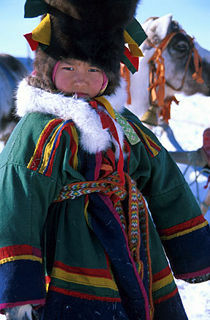 in Russian), one group of the various peoples that inhabit the Russian tundra. This Samoyedic group includes the Enets, Selkup, and Nganasan people. The Nentsy were referred to as "Yurak Samoyed," the term Samoyed coming from indiscriminate Russian usage throughout the centuries, deriving from the literal morphs of samo and yed, which translates to "self-eater." Since the twentieth century, "Nenets," their self-determined name which translates as "man," became the politically correct term. Due to the similarities in languages, historians believe that the Nentsy split apart from the Finno-Ugric speaking groups around 3000 B.C.E. and migrated east where they mixed with Turkic- and Altaic-speaking peoples around 200 B.C.E. They settled between the Kanin and Taymyr peninsulas, around the Ob and Yenisey rivers, with some settling into small communities and taking up farming, while others continued hunting and reindeer herding, traveling great distances over the Kanin peninsula. Those who remained in Europe came under Russian control around 1200 C.E., while those who lived further east intermixed with the Ugains, the Novgo, and Tartars until they too came under Russian control in the sixteenth century. Since the seventeenth-century unification, Russian rulers have had difficulty maintaining control over all the Sameyodic peoples, the Nentsy in particular. Resenting their oppressors, the Nentsy attacked government officials and outposts, having the advantage of superior knowledge of the terrain coupled with the incorporation of firearms initially supplied by the Russians. A new approach of assimilation was attempted in the eighteenth century, with a Russian Orthodox missionary movement organized to convert and educate them. However, they failed to directly engage the Nentsy. By the nineteenth century, life for the Nentsy had grown difficult. Alcoholism, exploitation by tradesmen and merchants, and forced re-locations by the government threatened to destroy the traditional Nenets lifestyle. Communism in the twentieth century furthered the decline in Nenets culture, with the creation of collective farms that halted their longstanding nomadic traditions, and the regulating of child raising by sending all children to government-run schools, disrupting the flow of culture passing down from one generation to the next. Industrial complexes also caused mass pollution in the Nenets region, furthering their displacement. Traditionally, the Nentsy lived in non-permanent settlements in a clan-based social structure, small bands all belonging to a clan name based on paternal descent. They were nomadic, migrating seasonally through the tundra and forests due to both economic and religious reasons; their shamanistic and animistic belief system stressed respect for the land and its resources and incorporated shamans, called Tadibya, forming the belief in a symbiotic relationship between the Nentsy and nature. Usually they inhabited conical tents called mya, or chum in Russian. The mya has a design similar to a Native American tipi but it is less vertical, and it is very closely related to the Saami Lavvu in construction, but is somewhat larger in size reaching up to 30 feet (9.1 m) in diameter. The traditional mya consists of reindeer hides sewn together and wrapped around wooden poles that are organized in a circle. In the middle there is a fireplace used for heating and to keep the mosquitoes away. The smoke escapes through a hole on top of the structure. The canvas and wooden poles were usually quite heavy, but could be transported by using their reindeer. The mya is still in use today as a year round shelter. 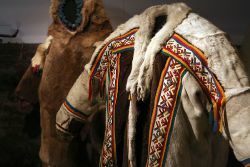 Excellent at hunting, fishing, and using natural resources without exploiting and damaging mother nature, such as using the furs and skins of slain animals intended for eating as clothes, and bones as decorations, the Nenets economy traditionally is based around the reindeer and the Samoyed dog. The Nentsy bred dogs to help herd the reindeer and pull sleds across the snow. Later, European explorers used the dogs for Arctic explorations since they were so well adapted to the environment. The Nenets language is called n'enytsia vada, and belongs to the Samoyedic branch of the Uralic languages (the other branch being the Finno-Ugrian). The main dialectal division is between the Tundra Nenets and the Forest Nenets. Notwithstanding the immense area inhabited by the Tundra Nenets, their dialectal differences are minimal. Their language reflects the traditional Nenets culture, with many descriptions and words for nature, animals, hunting, and reindeer references. The language was based loosely on pictographs for centuries, until an effort to create a written paradigm was created in the 1930s, using the Latin alphabet and Russian orthography. A rise in bilingualism of the Nentsy has made Russian the largest influence on their language. There are two distinct groups based on the Nenets economy: the Tundra Nentsy (living far to the north) and the Khandeyar or Forest Nentsy. 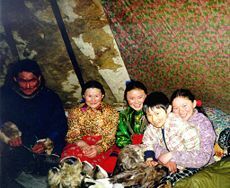 A third group, Kominized Nentsy (Yaran people) has emerged as a result of intermarriages between Nenets and the Izhma tribe of the Komi peoples. The Nentsy still continue to bear mongoloid characteristics: commonly short and stocky, dark skin pigmentation, epicanthic eye folds, flat faces, and sparse beards. However, a group of Nentsy from the Arkhangelsk region have more European features. Despite the collapse of communism in the early 1990s, the Nentsy continue to struggle with the lingering effects of centuries of oppression. The last census in 2002 showed that there were 41,302 Nentsy in the Russian Federation, making them by far the majority in the Samoyed group. Despite the immense area inhabited by the Tundra Nenets, they continue to form a surprisingly uniform group. Thus their future on the level of cultural continuity seems somewhat favorable. However, due to their loss of tradition, the Nenets language is facing extinction, along with much of their culture. There is a clear division between those who still continue with their pastoral reindeer economy in tundra areas, and those who gather in polyethnic villages and population centers. There are high rates of suicide and alcoholism within their society, along with low life-expectancy rates. The Nenets' struggle is comparable to the plight of Native Americans in the U.S.A.
↑ 1.0 1.1 1.2 1.3 "The Nenets" The Peoples of the Red Book. Retrieved June 5, 2007. ↑ Sven Haakason, "Yamal Culture", Arctic Studies Center, Retrieved June 5, 2007. Castrén, M.A. Grammatik der samojedischen Sprachen (1854); Wörterverzeichnisse aus den samojedischen Sprachen (1855); Ethnologische Vorlesungen über die altaischen Völker (1857); Versuch der koibalischen und karagassischen Sprachlehre (1857). Middendorf, Aleksandr F. Reise in den düstersten Norden und Osten Sibiriens. 1875. This page was last modified on 15 November 2018, at 23:27.